The first bird to ever land in my hand to take some seed was a chickadee at a park close to our house. It was one of the most exhilarating experiences I ever had. It also made the chickadee's one of my favorite birds. Since then I've had them land in my hand lots of time for seed, and have always been disappointed on a birdwatching outing when they haven't. We didn't have chickadee's in the yard for a couple years despite our attempts with their favorite seed and feeders. It was rather frustrating as we knew how close to the house they were because of the park nearby. Finally, one day we heard that familiar call, "fee bee, fee bee" and a chickadee was here, but he didn't stay long and only came around now and again. 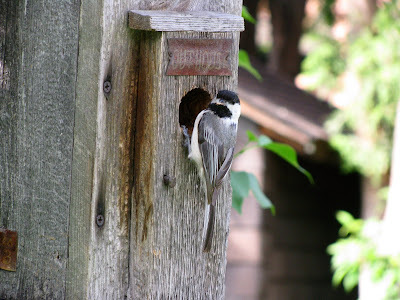 This year all that changed, and I am very happy to report that we have a pair of nesting chickadee's in the yard! They chose to move into a birdhouse that has been up in the yard for a few years now, and was put up as more of a decoration then anything else. We didn't know at the time that this shape of birdhouse is the chickadee's favorite. It's been fun to first watch them check the place over, and over again. This went on for at least two weeks, and then finally move in and build a nest. I don't think the eggs have hatched yet, as we see both of them flying around the yard a lot for food. It's very enjoyable to watch them pop in and out of their house, and we're waiting patiently for the little ones to arrive. Rob snapped the beautiful picture above of the male chickadee yesterday afternoon, just before he went into his house. He has some food (a bug) in his beak, for his lady. 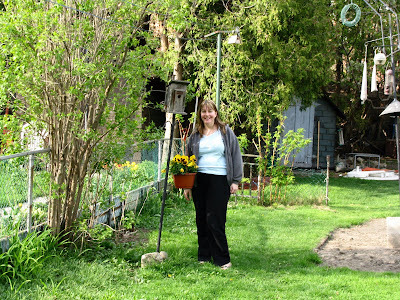 Here's another picture taken in early May before the lilacs bloomed to give you a better look at their nesting home. I wish I could see inside! Chick-a-dees are my favourite as well. They are natures weathermen. When the Chick-a-dee finishes his song, it's going to be a beautiful day. If they only sing, "Chick-a dee....", then it's going to be a rainy day. I laugh when the poor birds get confused on a cloudy day. There's nothing like the sound of spring when these guys sing! We have one in our tree, and I always say welcome home, little guy. I found some bird houses recently in our barn. You'll have to teach me what to do for them. JERSEY BOYS GETS EXTENDED AGAIN!